Your little ripper will look super cool in the Boulder Gear Bolt Cargo Ski Pant. This modern pant has all of the technology and features they need to stay warm, dry, and happy all day. There's a 10K waterproof rating, 80g of insulation, critical seam sealing, and zippered leg vents so they can cool down if they get too hot. The Bolt also has the Grow Feature, which allows the legs to be extended by 1½" when they grow. "What is the waist size and length of the xxl pants"
"The waist size of XXL is 31-32" and the inseam is 31"." "WHAT SIZE IS A 6/7?" "You would need an XS." "My son is 7yrs old and slim. What size should I get?thanks"
"The best way to fit your son would be to go by his waist and hip measurements. If you can provide us with that information we would be able to better recommend a size for him. " "Between these in a size XS and the Obermayer Prophet ski pants in a size 6, which has a slimmer fit? Thanks "
"They are both a very loose fit. Perhaps try the Boulder Gear if you are trying to decide which one might be slimmer than the other. " "so if my son is a 30- 32 would he need a xxl"
"Yes, the XXL should be perfect! " "My son has a 28/29 inch waist and a 32 inseam. Should I purchase the XL or the XXL? Thank you"
"Based on the measurements you have provided we would recommend gong up into a Men's size small. You can view the Boulder Gear size chart here ." "I am looking for a more loose fitting ski pant for my daughter. She is 9 and not one of those skinny kids and tends to be tall for her age. Her inseam is 26 and measure around waist is 29-30. What brand and size would work for her." "If you measured around where her pants would naturally sit, an XL would be the appropriate size, but the inseam would be about 3" too long, so it would need to be tailored. If the 29"-30" waist is measuring around the smallest part of her waist then a size Medium would be appropriate, but you would need to let out the growth seams to gain an extra 1.5" so the inseam would fit her. Good luck!" "Son wears a size 8 slim jean...wondering what size snowpants? Roughly 53 inches tall." "It looks like the best option would be a Small or a Medium. For better guidance, I would suggest using our sizing chart by clicking here "
"Yes, this is a pant that is meant for kids'." "Is this pant slimmer than the ravish? I’m looking for the slimmest pant for girls." 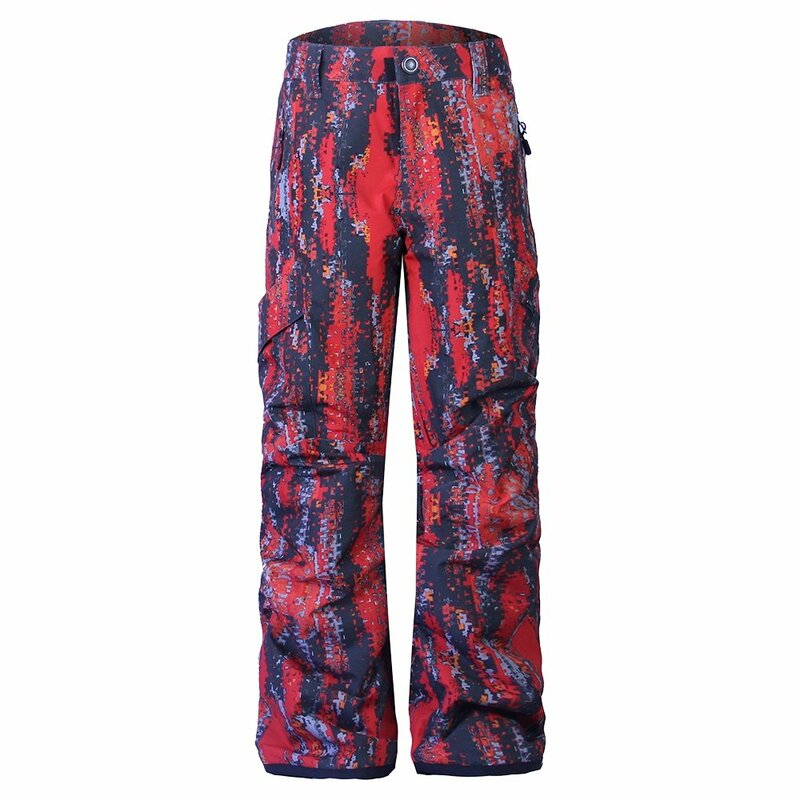 "The Boulder Gear Ravish Ski Pant is a slimmer fit as it is designed for girls. The Boulder Gear Bolt Ski Pant is a cargo pant that is primarily for boys. Hope this information helps!" "Can girls wear these?? Do they fit true to size? " "Thank you for your inquiry. The Boulder Gear Bolt Cargo Ski Pant are for any kids. According to reviews Boulder gear runs true to size, please reference the Boulder Gear sizing chart (Kids) We hope this information helps! " I purchase a pair of these Boulder Gear ski pants two years ago for my then, 9 year old. They held up to two snowy seasons of skiing, learning to snowboard, sledding, playing in the snow, and general cold weather tough play. He was growing out of them, so I was happy to find the next size up on sale! Great pants, warm, tough and comfortable. The adjustable waist is helpful too. Ski pants are fine. But I purchased these a week ago for a Christmas gift. Then they we're marked down further. Peter Glenn would not do a price adjustment. I will not buy from them again. Son loves these pants! They have held up, are warm and comfortable! We ordered these and a pant by Columbia. My 10 year old son is slim and the outer velcro on ski pants like Columbia just don't work as well as these pants which have the internal button/elastic system. Cool features like leg vents etc., they looked and felt great to him! This is our 3rd pair of Boulder Gear pants...pretty good quality and fit very well and seem to be true to size. I have skinny to average size boys. These were huge! Very roomy pants. Lots of pockets. Nice material. Purchased kid large. Age 14 wears a size 0 jeans. Very warm. Right to size. Excellent quality! These boulder gear ski pants worked well for a 3-day ski trip for my son in cold, wet conditions. Kept him warm and dry, and were comfortable and stylish.